Hooray! My April Julep Maven box arrived early this month. For this months style I switched from my usual bombshell box to the boho glam style because I love blue and orange! This months collection is all about brights! I loved the collection photos. Julep has also added a new maven style called the modern maven. This box doesn't include polish but has extra products. They released a nail strengthening serum and also a dry shampoo! My boho glam box was stuffed with goodies! This box included Julep Lena, Julep Kaylen, the new Mighty Nail & Cuticle Serum and rock candy!!! Julep Lena is a teal blue filled with gold shimmer that really comes to life in sunlight. The formula was great on this one and the coverage is veryyyyy nice! I used two coats but its almost a one coater. However, warning on this one...staining alert! When I removed this polish my cuticles were dyed green! I don't even want to think of what might happen I didn't use a base coat. Base coat is a necessity with this polish! 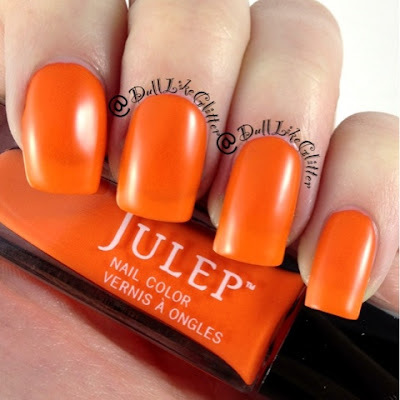 Julep Kaylen is described on julep.com as a neon orange creme. The neon pigment is very bright! But, I was slightly let down when I was it wasn't much of a creme. Even with three coats you can still see the visible nail line. This polish dries to a rubbery finish because of the neon. The formula is interesting. I can' of any other polish like this but the sheerness does kinda bother me. I'm on the fence about this one! The product in this month is Juleps Mighty Nail & Cuticle Serum. Julep suggests you apply their serum everyday on the naked nail or cuticles for two weeks to strengthen them and help prevent peeling. I can't wait to see how it works. Full review of this in a few days after I get to see it's effects! To try a Julep Maven box for FREE go to this link and sign up for their maven program by taking the Julep style quiz. At checkout use the code FREEBOX and your first box will be free! After that you can keep the free box and cancel the subscription or you can continue to get a box of polish and products every month to your doorstep for $19.99. You can't lose! Btw, maybe you can us the orange one as a jelly polish?